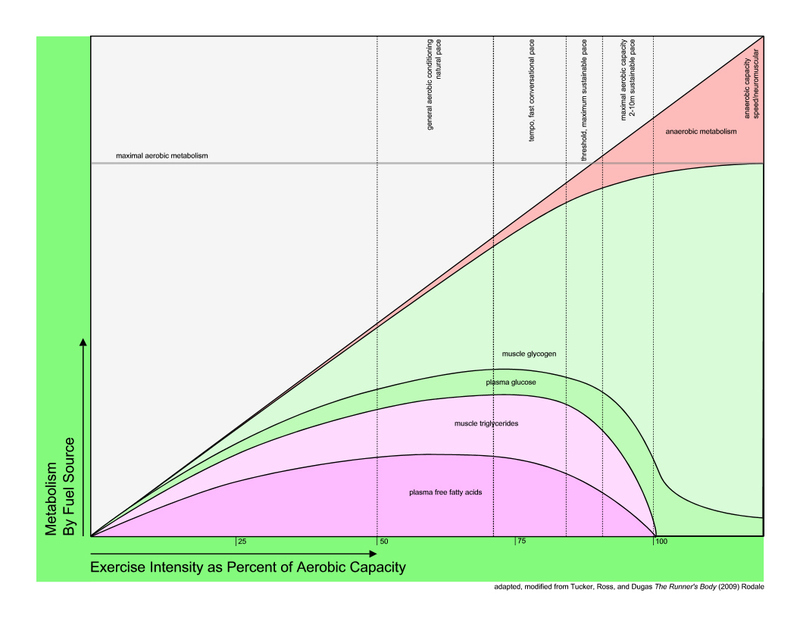 The above chart is representative of what fuel sources are usually used by an athlete’s body during endurance exercise at various intensities, relative to their aerobic capacity. Of course, various factors will change what exact proportions of fuel an athlete is using, and what their body is capable of at any given moment or on any given day. Below, I have a few notes about various factors that come to mind that may alter fuel utilization during exercise, and I would encourage you to email me at Nate@EnglishEndurance.com if you have questions or suggestions about this page. Fatigue in cycling and endurance sports generally is a complex phenomenon, and really can’t be attributed to any one or two factors. Fuel availability, hydration, muscle soreness, neuromuscular fatigue, motivation, weather extremes, and other factors will affect changes in your ability to exercise hard or long. That being said, carbohydrate fuel availability is one of the key factors in determining an athlete’s fatigue level, and more than most things, will limit an athlete’s capacity for high-intensity exercise. Your brain is constantly monitoring blood glucose levels, muscle glycogen stores, body and environmental temperature, etc., and you will have good or bad sensations of fatigue largely based on this information. When carbohydrate fuel availability is limited, your body will automatically reduce its maximal sustainable power outputs and will necessarily shift your fuel utilization to the left on the graph above relative to your perceived effort, simply because you aren’t able to go as hard for as long. As a preventative measure against completely depleting carbohydrates stores, your brain will take measures to lower intensity to allow for more fat utilization. To consider an example, let’s say I’m a fit cyclist and can sustain 350 watts for 20 minutes when well fueled. If I’m at the end of a 5 hour ride, I may have a similar or higher perceived effort riding at 320 or less watts, but because my muscle glycogen is significantly diminished after hours of riding, my brain is going to say to itself “I don’t have as much fuel right now, I’d better conserve energy.” So, giving a 90% effort may yield around 320 watts, and be sustainable for 10, 15 or maybe 20 minutes, but it will feel just as hard, if not harder than riding at 350 watts when I’m fresh and warmed up at hour 1 of the same ride. This problem can be addressed temporarily by consuming carbohydrates to increase blood glucose. Often these carbohydrates may taste sweet (e.g., a drink mix or gel), and the sensation of having sweet things in your mouth acts as a signal that fuel is available to you, and will somewhat reduce fatigue and increase your capacity to do work. Also, riding at 320 watts at hour 1 of the ride will probably use up more glycogen than at hour 5 of the same ride, because it is more available, whereas 5 hours into the ride, there isn’t as much glycogen and blood glucose left, so your body will probably be burning proportionally more fat at the same power output. This fat will increasingly be in the form of plasma fatty acids released from adipose tissue as your bout of exercise progresses. Muscle triglyceride utilization decreases over the course of a medium to long bout of exercise, like a 5 hour ride. As your fitness improves, you will have an increased aerobic capacity, your muscles’ mitochondria will increase in size and number, you will have more enzymes for burning both fat and carbohydrates, you will be more mechanically efficient, and I would hypothesize that your brain also becomes better at regulating exercise intensity and fuel utilization so as to delay fatigue and improve your capacity to exercise at any given intensity. Well, probably those things are by definition a large portion of what “improved fitness” actually means, but in any case, you’ll be better at riding or running or whatever it is that you do, and one key feature or defining characteristic of improved fitness is that you’ll be able to burn more fat at a given intensity. It is possible that if you were doing hard efforts in your training in the winter months that your maximal aerobic capacity could be similar or even the same in February for that first 4 hour ride as it might be in June or July for the 5 and 6 hour rides you might be doing. But, having done longer rides regularly, your muscle glycogen stores will be greater and your fat burning capacity will be increased in the summer from months of longer training sessions. Most athlete’s training probably wouldn’t be conducted like this, because ideally you would increase your aerobic fitness throughout the season, but all the same, some athletes may do exactly that because of their competitive focus and training patterns. A cyclocross racer who races October through January, but also races mountain bikes and road in the summer could be such an example. That rider would no doubt be fit in December, and may have the same aerobic capacity as in July, but because cross races are usually about an hour or less, the need for 4 or 5 hour endurance required for summer road racing is lacking, and training would reflect that, and therefore also endurance fitness. Generally, what fuel an athlete burns during exercise is going to be largely what they have eaten, especially what was eaten most recently. If you consume tea or coffee before exercise, you’ll probably burn a little more fat and/or be able to exercise a bit longer. If you eat a number of carbohydrates before a bout of endurance exercise, your body will burn more carbohydrates, which may or may not be problematic. If you have not had sufficient carbohydrates since the last time your glycogen stores were emptied, you will probably burn more fat, but also not be able to go as hard or as long, because your brain will be aware that you have insufficient carbohydrates to do so. Carbohydrates are the fuel for high-intensity efforts. Endurance sports nutrition is a complex thing, but suffice it to say, to perform at your best, you need to have sufficient glycogen stores so that your body is fueled and your brain ready to perform as hard and long as possible. This is generally best done by refueling immediately after completing any intense bout of exercise. It is also best not to overdo carbohydrate consumption immediately preceding a bout of exercise. Slowly digested carbohydrates, with some protein and fat, that are easy on the stomach are probably best an hour or two before exercise… think oatmeal and nuts, or a couple of fried eggs on a slice of toast. Or, on the other hand, you could eat a big bag of candy or have a tall stack of pancakes with syrup an hour before your ride and your body may well be ready for a solid bonk, even though it’s well fueled. An acute consumption of large quantities of carbohydrates will produce a rise in blood sugar and a resulting increase in insulin production, the hormone that primarily acts to shuttle sugar in your blood into your liver and muscles for storage. High insulin levels can be great for recovery precisely because they promote carbohydrate storage and protein synthesis, but while you exercise your body will have lower levels of insulin and higher levels of glucagon (the antagonist hormone to insulin) to help break down glycogen to burn. So, don’t overdo it in your pre-workout snack or meal. At optimal cadences, fat will be used more effectively as a fuel source, because more slow-twitch fibers will be used to generate force to pedal your bike. At higher than optimal cadences, the oxygen cost of cycling increases (i.e., you’re less efficient). If you were cruising around at a natural pace at 80-90 rpm, you’re probably self-selecting a fuel efficient cadence that will delay fatigue, because you’re probably using as much fat as fuel as you’re capable of at that intensity. The longer you can delay drops in muscle glycogen levels and blood glucose levels, the longer your body will be willing to work hard. While still cruising comfortably, if you intentionally increased your cadence to 120 or 130 rpm, you will be less efficient and you’ll be using up more energy to do the same amount of work. Or, if you dropped your cadence down to 50 or 60rpm at the same speed, you must increase the force with which you pedal by about 50% in order to maintain the same power output, and you therefore require the recruitment of more muscle fibers, especially fast-twitch fibers, which will use up more glycogen and produce a little more lactate, though at a moderate pace, lactate levels will still be low. Basically, if you’re just training for aerobic conditioning, don’t mash (you’ll eat up glycogen) and don’t spin too fast (you’ll be less efficient). But, it’s also good to keep in mind that optimal in-the-saddle cadences will increase with power output. If you’re cruising at 150-200 watts, then you’re probably most efficient at 75-85rpm; if you’re riding tempo at 300-350 watts, you’re probably best at 90-100; if you’re really going for it at 400+ watts, then you’ll probably do well at 100 or more rpm (unless you’re out of the saddle).